I wanted to create a baby girls nursery that was not too "baby" and not too "girlie". I think I succeeded on both ends, and love the result! My husband and I are very ocean-minded people. We wanted our love of the sea to translate in the nursery. We displayed this through the art, and small details throughout the room. We only hope that our daughter will love the ocean as much as we do. I lean more towards modern, but not so far that the fun is taken out of the room. I like clean lines, and bright pops of color! I LOVE my curtains, probably because they were the most labor of love. I searched high and low for just the PERFECT fabric. After going through many samples, I finally found this fabric, and the colors and size of print were exactly what I was looking for. I DIY'd all 8 panels myself, and the final look really completed the nursery. I kept everything very neutral and chose to bring out the the girlie touches with accessories and art. This makes it very easy to either convert to a big girl room down the line, or alter it into a little boys room if need be! Wow, this is really beautiful and unique. Can you share the paint color with us. I love the curtains too. Is it Ikea fabric? I love this room! I am getting ready to start planning my baby’s nursery and this is SO inspirational!! Where did you find that great rug? Great job! Thanks so much everyone! The paint color is Benjamin Moore, Quietude. The fabric is called Dahlia Nest by Valori Wells. I bought it by the yard on etsy.com. The rug I picked up from World Market a couple of years ago. It is my favorit! I love the colors. I like the cool and refreshing colors you used. And it’s so calming to the senses, too. And I absolutely love the way you put up those lovely little details and the way you added those splashes of bright colors. 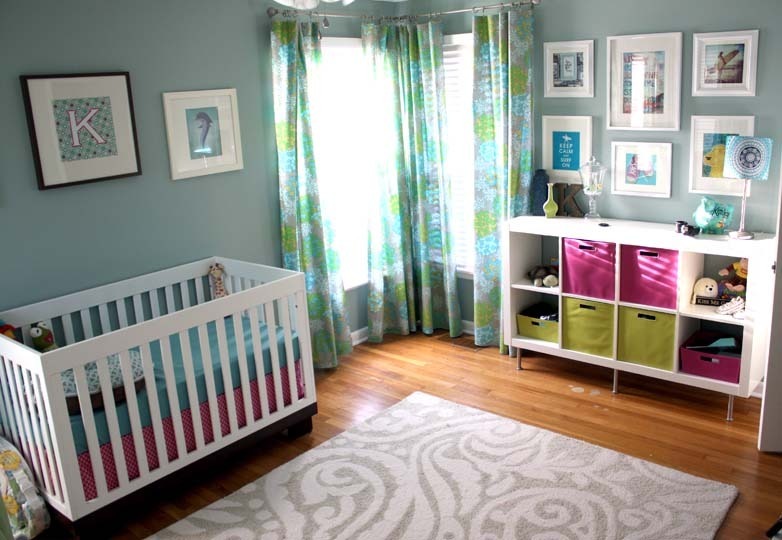 The green/white/gray color scheme makes this a pretty room for a baby girl with a zen kind of feel to it. 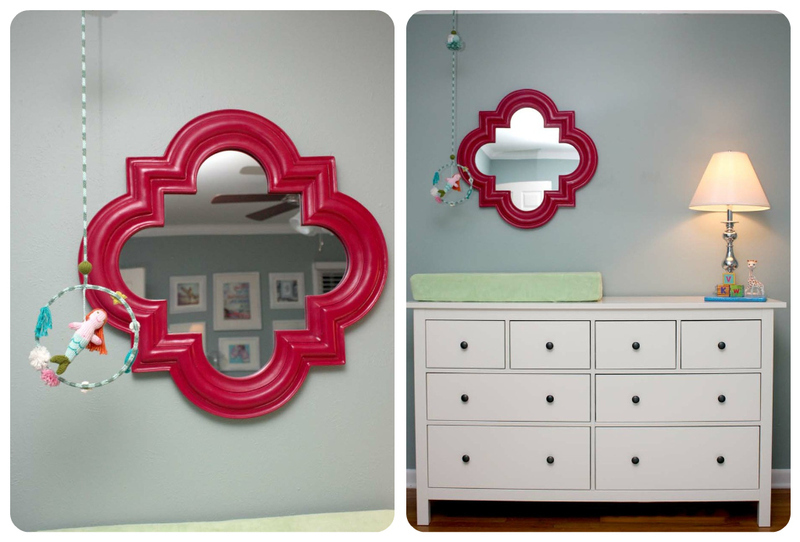 But those accents with pops of bright red (the mirror), orange (mobile) and pink (storage) add a very fun and intresting element to the nursery. Is that a new Benjamin Moore color for the wall? I just went to their website and could not find it. Thanks. @cjax01: I just double checked the color. It’s actually Sherwin Williams Quietude. We color matched it at Lowe’s with Behr Paint. Thanks for the quick response. I love the room and color. I love EVERYTHING about this nusery!!! This is one of my favorite nurseries on here! Where did you get the pink mirror? @Leahburkett: Thanks! The mirror is from Garden Ridge. It was actually a dark, matte black. I painted over that with pink arcrylic paint! Spray primed it first, and then sprayed a glossy finish after. This is by far my favorite room! Where did you get the white frames from? I love starfish/seahorse/fish mobile! We did an ocean theme in similar colors, and I haven’t seen a mobile as cute as that one. I love this. I’ve been designing our baby’s nursery in the same manner – not too “baby”. I love this! Where did you find your curtain rod? I have the same corner windows and am having a hard time finding a rod for it. That is exactly what I want for it! Thanks! I love this baby room. Where is the crib from? The glider looks like the Little Castle Monaco II, how do you like it??? I’m debating that one and I’m hoping it will hold up. Love the crib! Where is it fom? i love both the glider and the dresser — can you let me know where you got them both? thanks, the nursery is fantastic!! Love, love your nursery! We want to have the same feel for our baby girl’s nursery. Clean, neutral and fun! I absolutely love the console with the fabric boxes. Where did you find it? Thanks in advance! Love the colors! Can you share where you got the rocking chair? Love the nursery! Could you tell me where you got the storage unit?